There are two main things that come to mind about fair use when we’re talking about its abuse online. The first being the transformative properties of someone’s work in regards to the use of someone else’s work. In other words, if Person A intends to use Person B’s work in their own work, is A’s work being a rip-off of Person’s B work, or is Person A adding something to the source material (Person B’s work) that makes what they’re doing entirely different and a work onto itself? The most maddening thing about this is that this stuff isn’t even deceptive or exploitive of loopholes - it’s that it absolutely, blatantly goes against fair use and YouTube’s community guidelines, and YouTube is simply being silent and, for some reason, refusing to enforce simple rules. The sad part is that it’s probably not happening out of ineptitude - we’ll get to that later. Many discussions by other YouTubers like h3h3Productions, GradeAUnderA, and I Hate Everything, among many others, are shedding a lot of light on this abuse and sparking a lot of discussion about this. There’s one that’s sort of a poster child for these kinds of pages called SoFlo, as he has a hand in both Facebook and YouTube. What he does on Facebook, though, is provide 3-5 second commentary before showing content he ripped from somewhere else, then adding white or black bars with random text. Before that, he made himself famous running a prank channel on YouTube called SoFloAntonio (an entirely different yet equally disgusting genre of content on YouTube). It’s slightly more transformative, although not nearly enough to warrant it as fair use. Of course, the story here is the same - pages like these thrive while Facebook does absolutely zilch about it. h3h3’s videos cover SoFlo’s antics extensively. The second main thing regarding the abuse of fair use is accreditation - are the makers of the original content being used being credited for that work when used elsewhere, and do they benefit from its value? This is one of the things that anti-reactor YouTubers are complaining isn’t being done correctly. The good thing (well, kind of) about this is that some reactors are starting to cave and now drop a link in the description box to the original content or to the pages of the creators of that content. However, to think this should suffice completely ignores the inherent value of accreditation in the first place. Many of these YouTubers make their living from the creation of their original content - the money they make from their channels is obviously of utmost importance to them. When reactors take their videos and host them on their channels, those reactors are financially benefiting from the views the mirrored content receives, while the original creators get absolutely nothing. Some reactors argue that this gives them “exposure” and “promotion”. GradeA debunks this myth in one of his videos, basically saying that reactors’ viewers just don’t see the point in viewing the original content or other content from its creator if it appears on reactors’ channels (i.e. their subscription box) anyways. As I alluded to earlier, there’s a bit more nuance with Facebook pages. Sure, you’ve got your SoFlo-like pages that barely touch the content, but a lot of bigger pages from online publications like INSIDER (along with its sister sites Business Insider and Tech Insider) heavily transform the content they use, usually by summarising the content they use. And here’s the thing: I follow these kinds of pages - in fact, it’s most of the pleasure I derive from Facebook anymore - and a lot of their content is interesting and informative. But before you call “hypocrite”, think of why this could be a serious problem. If people, myself included, are entertained by the summarisation of original content, what reason would we have to view the original content, even if it had been credited? Mind you, some of the content they produce is original, but overall their product is summarised information, oftentimes based on trends and content that already exists. Some media companies even go as far as taking a video, embedding it at the end of a written post, and in an effort to prolong the content (more ad space, longer page visits, etc. ), rip snippets (again, summarisation), then format them as GIFs with minimal commentary (case in point). It doesn’t help that Facebook’s algorithms favour this kind of “content”, either (which brings me to a previous post when I linked to that Onion piece). While highly transformative, it devalues the original content and steals from its potential share of viewership, thus revenue. On the flipside, some of that might actually translate to exposure and view count growth for those original content creators. But with so many barriers like attention span of users, algorithms, and original content being buried under layers of SEO-quota-reaching garbage, it’s hard to believe that being the case overall. This all boils down to the exploitation of an inherently flawed system. That said, I think the blame should ultimately lie with the supposed stewards of the platforms and communities being affected, those being Facebook and Google (which YouTube’s a subsidiary of) themselves. They’re the ones responsible for having cultivated these issues. And yes, I think that’s exactly what they’re doing - they’re not just passively encouraging this by doing nothing, but they’re actively encouraging this by doing things behind everyone’s backs. That’s not all the evidence of SoFlo having direct affiliations with Facebook, either. 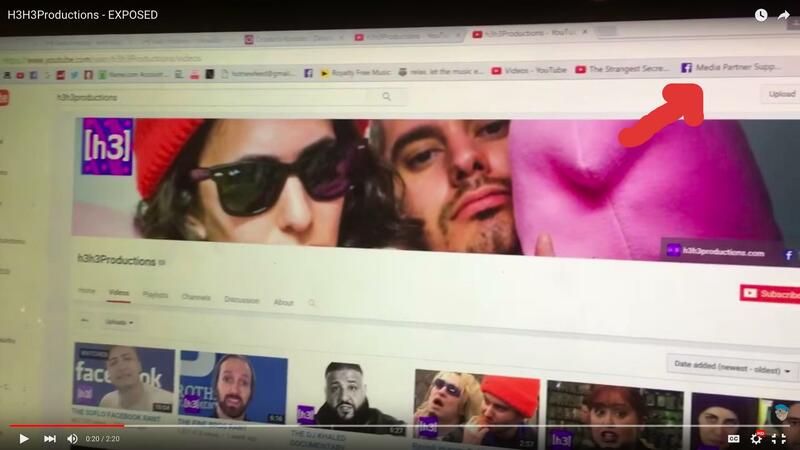 Awhile back, h3h3 created a parody page in response to SoFlo’s own Facebook page. The page was taken down (currently back up) and all the likes were shifted to SoFlo, so anyone who liked the page got updates from SoFlo’s page. This was done completely without notice or consent, and as far as I’m aware, there is no available tool to merge two pages with two different admins. As low as it is, I still don’t think it’s unlike Facebook to do this at all. It somewhat ties to their over-arching objectives of increasing user retention so that they’re exposed to more ads. It also takes share of viewership away from other internet platforms as content from those are being ported over to Facebook by the likes of SoFlo anyways, thus increasing the value of ad space on Facebook. Let’s go back to YouTube for a minute. One of I Hate Everything’s latest videos focuses on their content strategy, in that they also use algorithms that favour some types of content as opposed to others. That’s why the genres they highlight are so popular nowadays. My concern has to do with why YouTube bothers to do this while choosing to ignore taking on the responsibility of defending fair use on their own platform. I think it’s obvious - like Facebook, they prioritise overall viewership. Rigging the front page to feature late night talk shows and gaming channels attracts certain audiences to watch and keep watching videos on YouTube. Because those kinds of videos are more or less a mainstay on the default homepage, I think users in that audience without an account treat that as their subscription box. The extent to which YouTube has a hand in what content you see goes much broader than that (e.g. what videos appear first in search results, recommended videos, etc.). Most of the time, users are shown videos from channels that are already popular - it perpetuates a vicious cycle that further and further retracts any adequate exposure for smaller YouTubers. In fact, it’s even worse than that - some of these YouTubers are victims of copyright notices and full-on takedowns because of how undervalued they are by YouTube themselves. Hypocrisy has never taken such a truer form. Casey Neistat, one of the hardest working YouTubers and probably my favourite, once called YouTube a meritocracy, in which success - popularity, wealth - is based on one’s talent and hard work. That’s what we all hoped YouTube would be. Sites like Patreon are keeping that dream alive. On the other hand, Facebook probably shouldn’t have even been in the content-monetisation picture to begin with. Yet here we are, two giant tech companies funded almost entirely by ads, running platforms under the guise of yesteryear’s dreams of brand new avenues to achieve success. Yet in reality, they’re just facsimiles of the mediums that came before them. Although my gut tells me what they - Facebook and Google, SoFlo, online publications, YouTuber reactors - are doing just isn’t sustainable. Maybe because audiences always gravitate to something else eventually. Maybe because people will finally see through their shenanigans. But almost definitely because they’re doing the wrong thing. At the end of the day, abusing copyright and fair use is against the law. I hope it’s only a matter of time when their comeuppance will catch up to them.